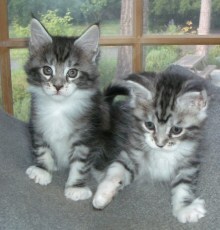 Our kittens typically go to their new homes at 12-14 weeks of age. They come already neutered or spayed, microchipped, registration papers, pedigree, and a full set of shots. The two silver tabby and white babies at left are from one of our previous litters: Hana's fourth litter, Moonrise and Moonshine ("Rise & Shine" -- so named because they often woke us up very early). They are six weeks old in this photo. Update as of 8/27/2012: We are currently "on hiatus" from breeding, meaning that we are not breeding right now, but may begin again at some point in the future. You can see photos of our previous litters here.